I have this theory that everybody has a talent. Rich, poor, clueless—it doesn't matter. I honestly believe that every human being on earth is born with one special gift. The problem is, not all talents are created equal. People think that talent means you sing, or dance, or act. But those are the glory talents, the ones that everyone wants, and for every diva out there, about a million other people are walking around with one of the lesser gifts, the kind that don't get their own videos. Cassie Howard believes everyone has a talent. Unfortunately, hers is taking second place. No matter how hard she tries, she’s always second best . . . in school, in life, and especially in love. When Cassie discovers new-boy-in-town Kevin Matthews she wants him on sight. But so does conniving Sterling Carter, a ridiculously beautiful preppy princess and Cassie’s enemy since freshman year. Sterling is the kind of girl who always gets it all, and Cassie . . . isn’t. Is there any point even trying when the first fifteen years of Cassie’s life have proven she’s doomed to fail? 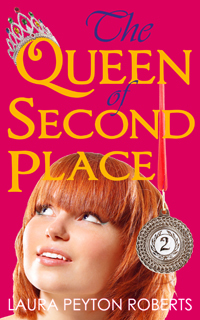 Can the Queen of Second Place ever truly win? With newfound determination and the support of friends whose not-so-glorious talents range from parking cars to whistling, Cassie sets out to capture Kevin’s heart—and make herself first at last. Read an excerpt from this book. Already read it? Solve the crossword puzzle! images contained within this site are copy protected under international copyright laws.